Scotland stay undefeated at Gold Coast as they held off resurgent Cameroon 63-52 to keep medal hopes alive. Coming off a high from the win over England, Scotland now faced Cameroon in their second game of the tournament. After England demolished India earlier in the day and Cameroon also claimed victory over the Indian team, a victory would send them to the top of the table in the group stages. Scotland started with the same 5 as they did against England and used their perimeter threats to run out to an early 6-1 lead behind deep three’s from Rocks’ duo Murray and Achara. Cameroon tried the same approach but nothing was falling, with no set offence they were throwing up any slightly open look they could find. Ali Fraser dominated his man down low and showed a class array of post moves for an easy two gave Scotland a 10-3 lead midway through the first quarter. Youngster Sean Nealon-Lino was again, the first to check in off the bench, making an immediate impact on the defensive end, hustling hard trying to save the ball at any opportunity he could. Chris Cleary also checked in and came out like a man on a mission as he crashed the glass on both sides of the floor. Fouls became an issue for Rob Beveridge’s men, but it didn’t cost them as Cameroon shot just 2/6 from the line and failed to hit anything for the last 7 minutes of the quarter due to the suffocating Scottish defence. Scotland led 15-4 at the end of the first period, Cameroon only shooting 6% from the floor. Fraser continued to dominate down low for Scotland, causing issues for the Cameroon defence. The Cameroonians kept grabbing offensive rebounds but could only muster 1 point from a free throw in the first 2 minutes of the 2nd quarter. Cameroon finally managed to use their offensive rebounds and convert as Franck Yangue came up flying and threw it down to bring the score to 16-7 with just over 7minutes left in the half. Bevo called time and demanded his men step up defensively, sensing that their comfortable lead could evaporate if things continued. Scotland started to come up empty on the offensive end as the Cameroon coach, Jean Ntep, sorted out his defence. Kieron Achara was putting his body on the line to hustle for offensive rebounds and drew his 2nd charge as he beat his man on transition. A tough tip rebound from Fraser Malcolm straight to Murrays hand left him wide open as he sunk the 3 to give Scotland a 13 point lead with a minute left, and then hit a deep 3 from just past the halfway line to put Scotland up 29-15 at half time. Fraser Malcolm opened the scoring for the 2nd half on a wide open 3 in the corner The 2nd period was much better for Cameroon offensively as they hit a 3 and two highlight plays as Bogmis and Kome slammed home two statement dunks over the Scottish defence. Cameroon went on to put up 10 points in the first 3 minutes, causing Beveridge to call an early timeout. Ntep used his bench more and they thanked him for the chance by playing great defence and started converting their 3 point attempts, and by the end of the 3rd quarter, Cameroon had closed the gap to 44-40. Cameroon’s Essome hit a deep 3 to start the final quarter and the comeback was on as they only trailed by 1 with Scotland struggling against the high-pressure defence. Later in the quarter Jonny Bunyan got in on the scoring as he hit a beautiful text book 3 coming off the screen to get the lead back to 4 for Scotland. Scotland’s hearts stopped as Achara went down clutching his face after an elbow, nevertheless he was resilient and converted the freethrow off the Technical foul charged to Cameroon Coach Ntep. Following this, Scotland started to jump out to a 12point lead behind some excellent personal play from Gareth Murray. 18-year old, Sean Nealon-Lino was receiving career high praise as he hit a rainbow 3 off a perfect backdoor baseline cut to give Scotland a 58-50 lead with 2 minutes remaining. 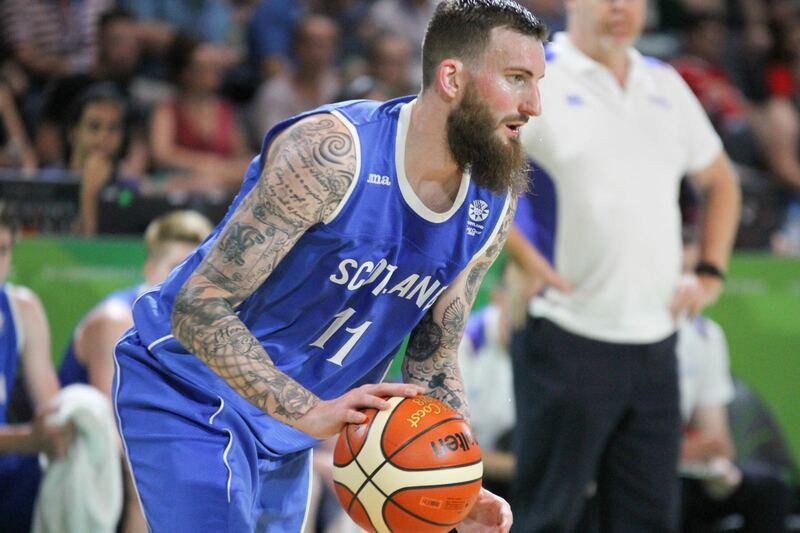 Gareth Murray iced the game for his Scottish boys on a pair of free throws and a 3 in the final minute of the 4th as Scotland claimed victory 63-52 over Cameroon. Scotland now sit comfortably at the top of their group, having confirmed their spot in the next round, and will face bottom of the group, India tomorrow at 12:00PM.